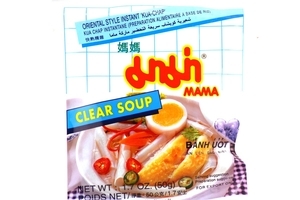 Mama Instant Chand Noodle Kua Chap Clear Soup (Banh Uot An Lien Dac Biet) in 1.7oz (49g) pack. This is a delicious soup made by simply adding boiling water, or you can turn it into something extraordinary by adding fresh sliced chile peppers, bean sprouts, mint leaves, Thai basil, cilantro, or whatever you prefer. Distinctive because its made with nice white rice noodles not the yellow wheat-based noodles typically found in Mama (for example pork). Product of Thailand. Rice flour, salt, suagr, flavour enhancher (E621, E627, E631), pepper.